As I had hoped the fog cleared and the sun came out on Sunday afternoon. Both the top and bottom spent a bit of time in the sun while I set up the new HVLP sprayer that I picked up on clearance from highland woodworking. I’ve got to say the sprayer was a great addition to my garage, it makes finishing so much quicker and easier. 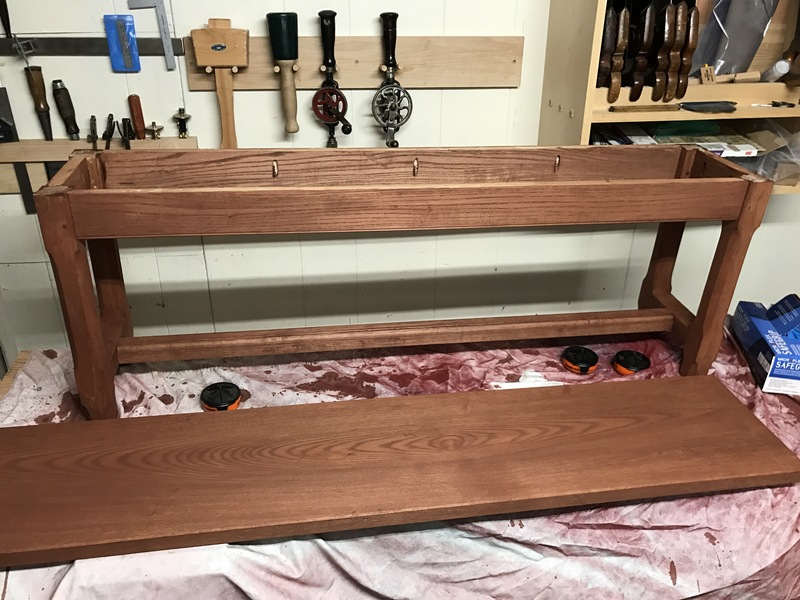 The top received around 7 or 8 coats of amber shellac (thinned from the can to 2 lb) and the base received 1 coat of amber (to use up what was in the sprayer and 6 or 7 coats of garner shellac (in an attempt to darken in a bit more. I sprayed the parts separately and then reassembled. All in all I am happy with the results so thanks to Mr. 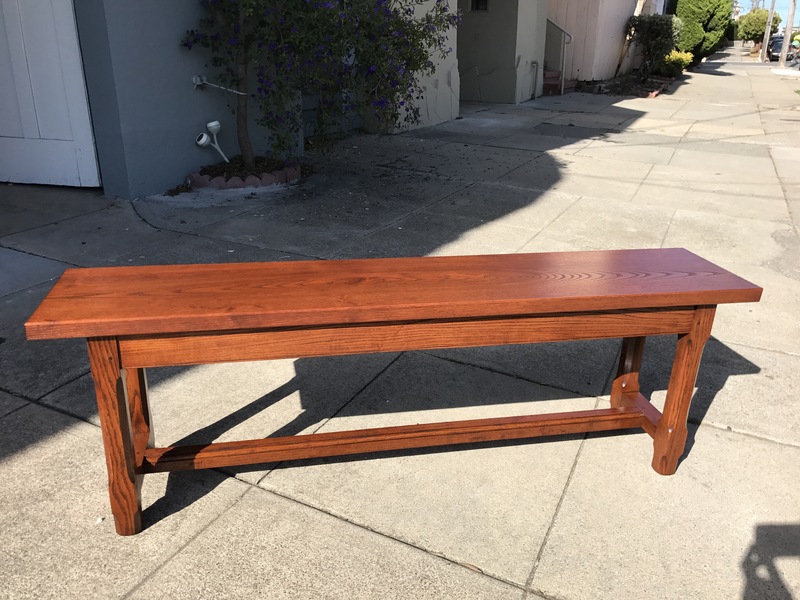 Plane for his staining advice last year. I will let the finish harden this week and then finish it up next weekend. I’m going to burnish it a bit and apply paste wax (clear on the top and darker on the base). This lumber was riddled with was I assume was Ash Borer damage that managed to heal. It makes for some interesting figure. I fully intended to only make a few samples but the second I wiped off the pigment and BLO mixture I knew I had a winner. 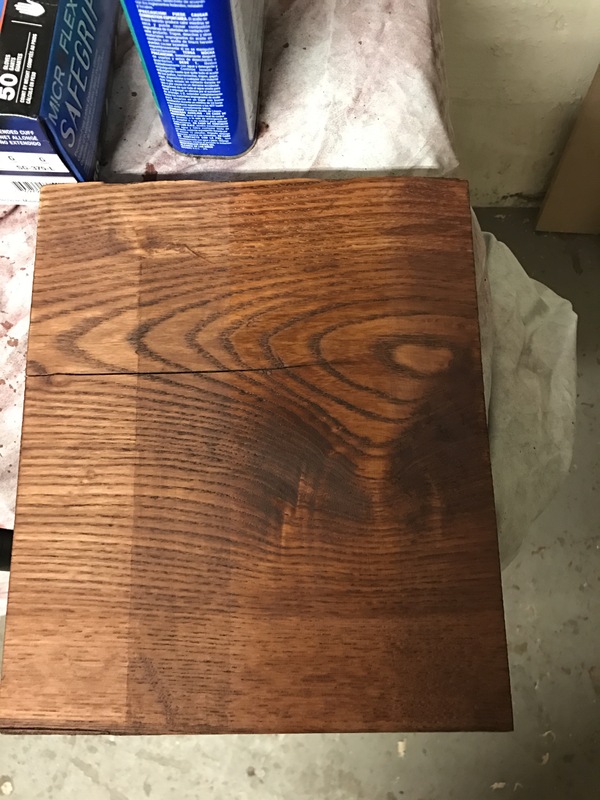 After rubbing in the stain and letting it sit a few minutes I rubbed off most of the oil. While the oil was sitting I wet sanded the top and a few wear areas on the base. After letting the pieces sit for 15 minutes I buffed the surfaces to remove even more oil. I am very happy with the outcome and very much looking forward to shooting shellac. I’ll let the oil cure until the weekend and hope that Sunday will be warm and sunny (and fog free). 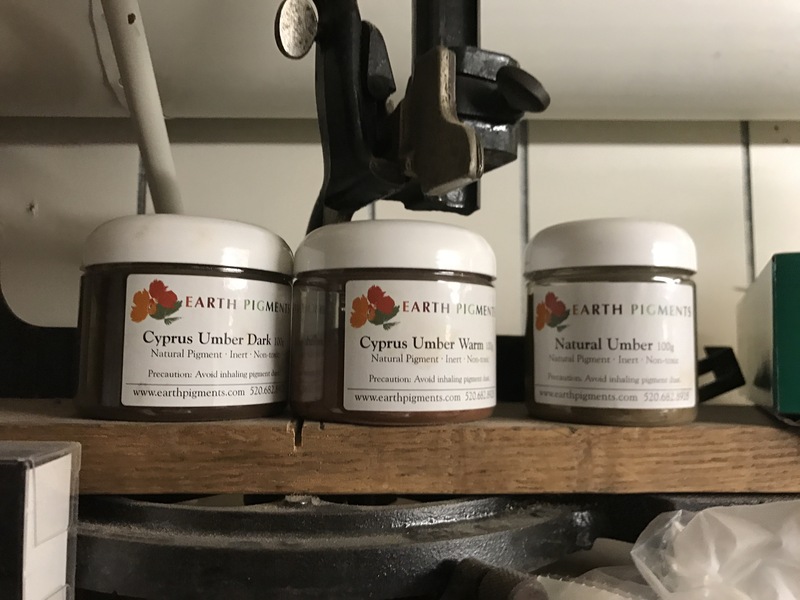 The mix was 1 part pigment and 3 parts BLO; primarily Cyprus Umber Dark with a bit of the Cyprus Umber Warm and Natural Umber added in for variation. 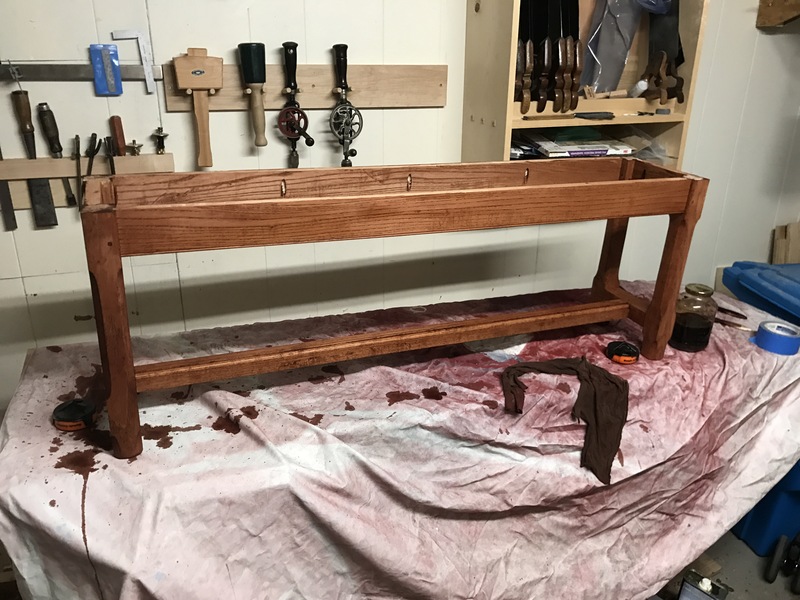 Earlier this week I finally got a coat of oil on the bench and left it to cure. I wish I had remembered Jack Plane’s post about adding lamp black to oil as the grain needs a bit more color. Hopefully I’ll wet sand another coat of oil later this week. In line with darkening the finish up a bit I did some more test work on the sample piece. I mixed up some warm and burnt Cyprus umber pigment with some water and wiped it on after taping off some areas (The golden strip has some spray shellac on it). 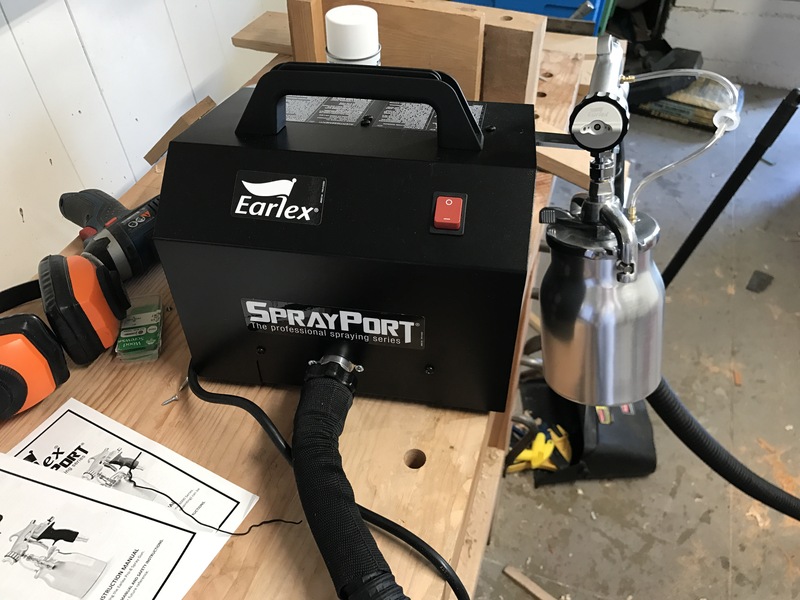 Based on this, I think I will mix up some oil with black epoxy colorant (which I have from a chair repair) and some the the same pigments and try to wet sand it into the test board. I was hoping to shoot shellac this weekend but the summer fog has arrived so it will depend on the weather. 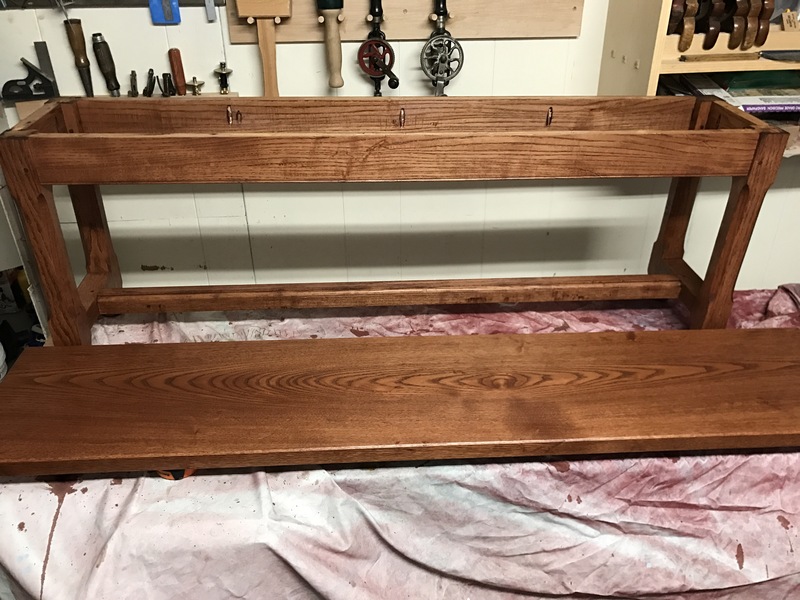 Last night I finally applied the stain to the bench. 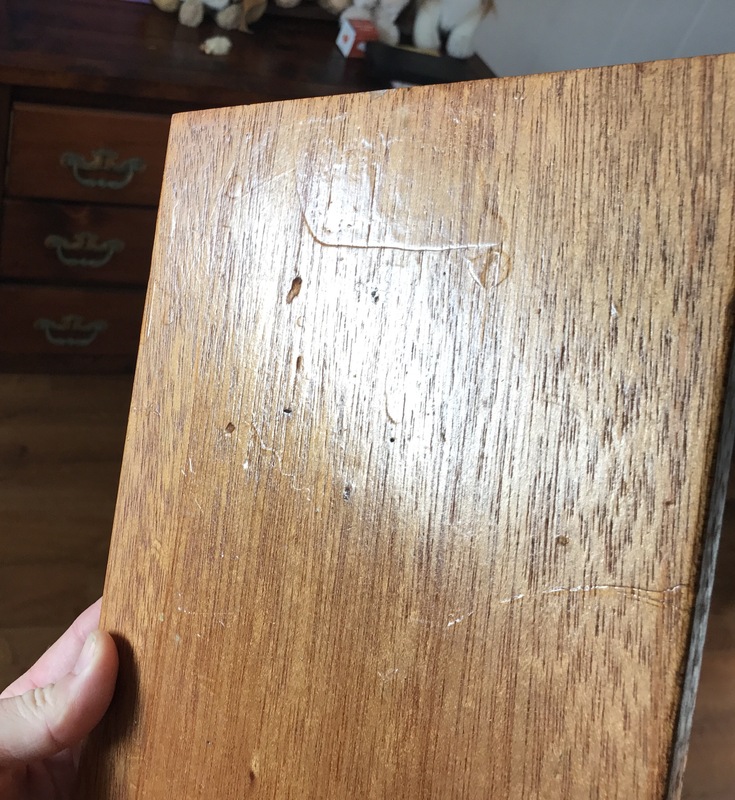 Once the wet wood had dried over night I lightly sanded the top to lower the grain. 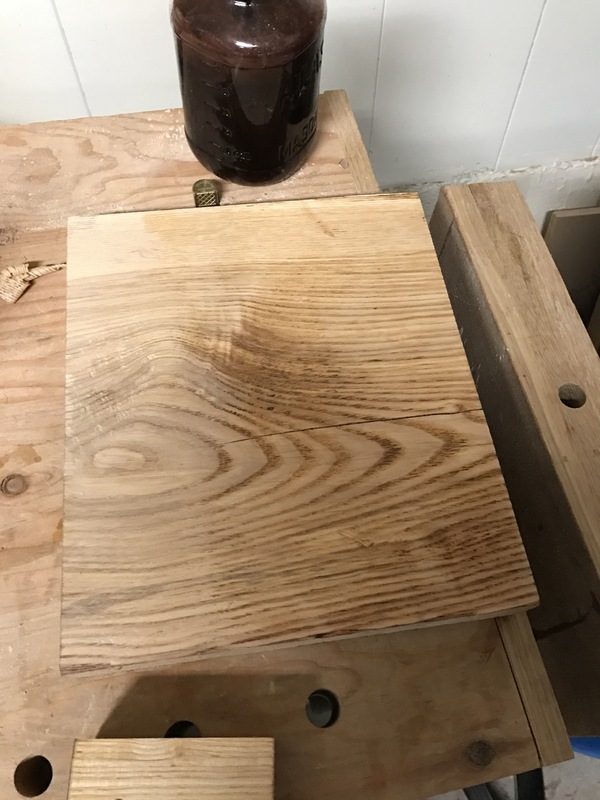 I left eye base with its raised grain as the base wood test pieces did not take stain as well as the top. 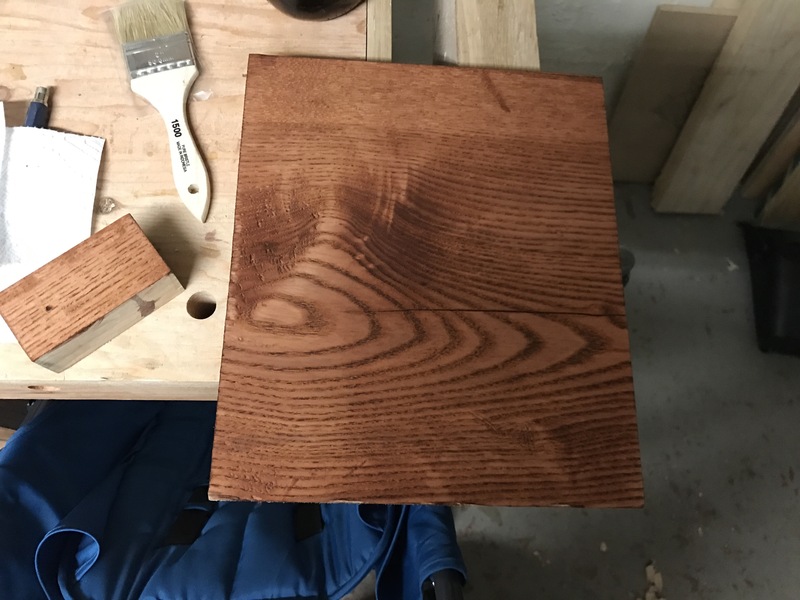 The end grain of the top was sanded down smooth. All in all it looks pretty good. This morning I noticed a few darker areas on the base that will need some smoothing and the grain needs some more highlighting. I’m going to add a pigment wash to the test piece tonight and see how that looks. After getting back from Hawaii work has been crazy but it did sand down the cutoff test peice to remove the old finish and finished with a hand block at 220. I wetter down 2/3rds and left it to dry. 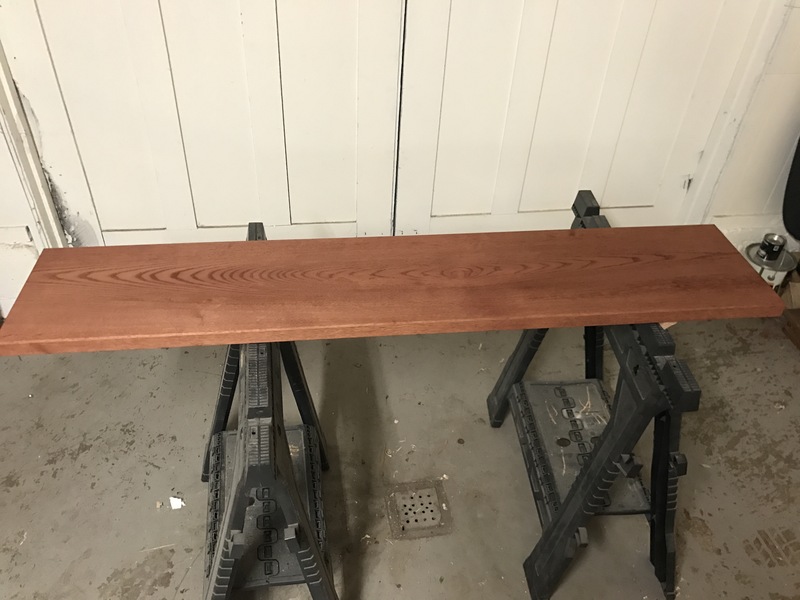 After drying I lightly sanded the right 3rd, stired it up, and brushed on a coat of stain, making sure to work it into the grain. After wiping away the stain the results were clear. 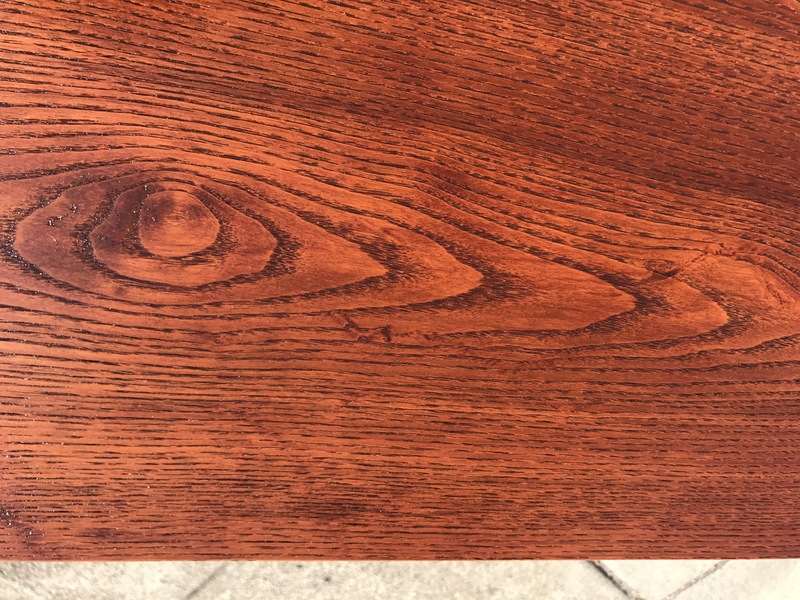 I had read years ago that raising the grain with water caused pigment stains to work better and the results are pretty clear. Time to let it fray and add a seal coat of linseed oil. This past week we have been at my parents house introducing them to their new grandchild. 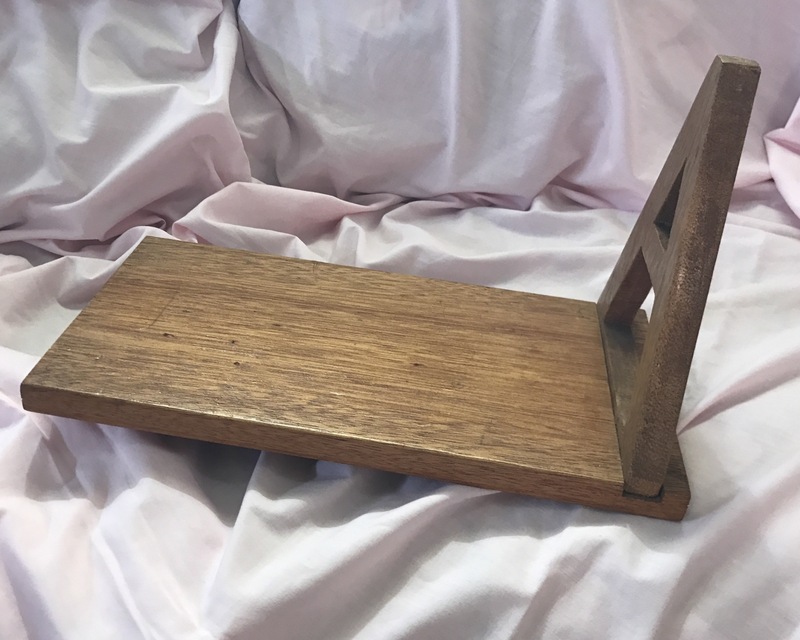 While reading bedtime stories to my oldest ( who was sleeping in my old room) I realized the bookrack on the bedside table was a project from 8th grade shop class. 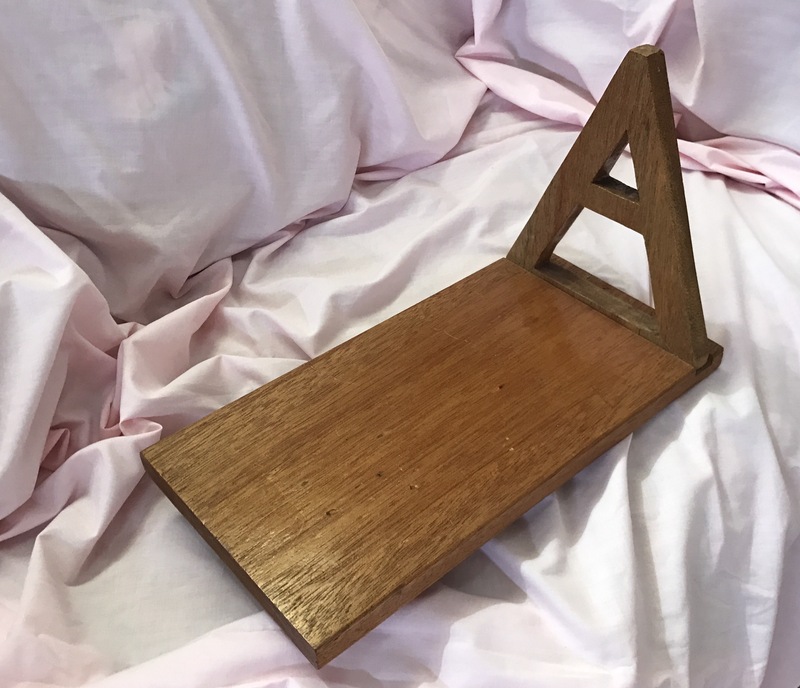 This basic slanted book rack was one of the shop projects everyone at Kainalu Intermediate School completed and it was the only non-plywood project (I think it’s mango). 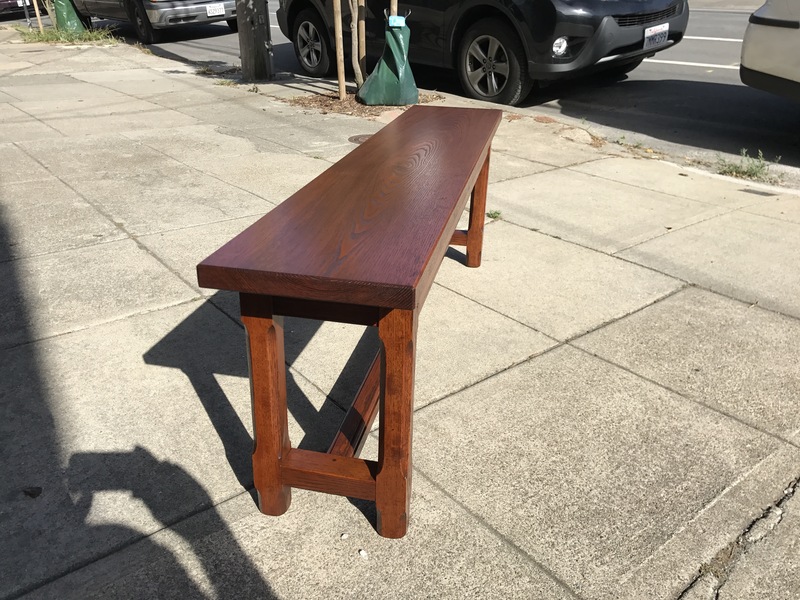 It’s basically my first project using hardwood. My finishing skill are only marginally improved.